Mike Cook just moseyed past us (as we're sitting here under the awning enjoying the lunch that the Mormon Meteor folks have provided us worked) and reminded us about the event (like we'd forget). 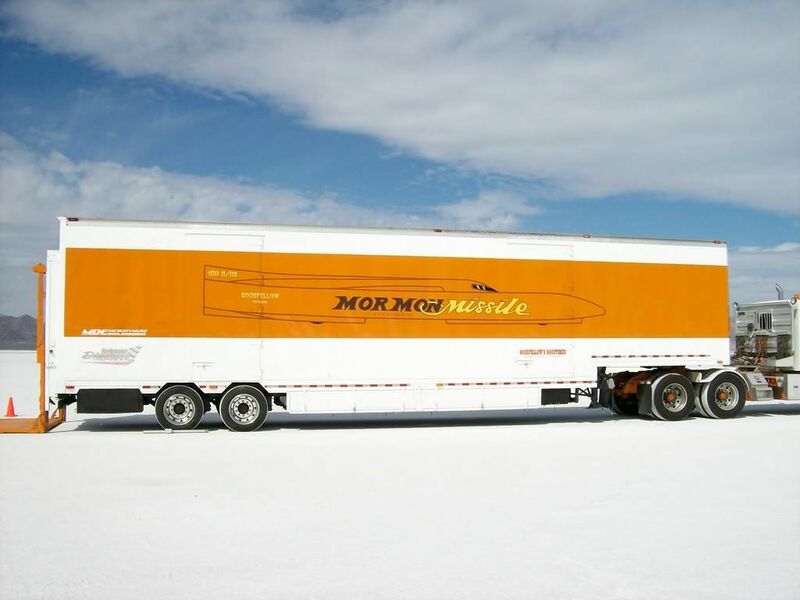 Poteet/Main Speed Demon, Nish Family 'liner, Burkland family 'liner, Buckeye Bullet II (H2 fusion car), and the Mormon Missile (Duramax diesel-powered 'liner). Those are the cars. Bike: Ack Attack, Sam Wheeler, and (dang, I forget his name) with the old Vesco 'liner powered by twin nitro Harley engines. That's gonna have a sweet sound, you betcha. Anyway, we'll be here at the beginning of tomorrow morning and take photos and videos. Stay tuned, folks. I don't know if I can fulfill specific requests for information, but I'll try. Be in touch, hey? 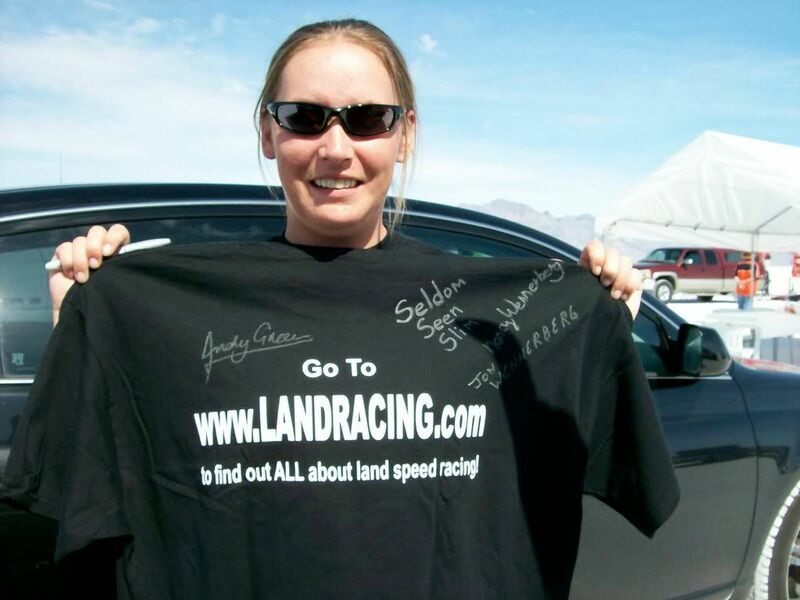 First of all, here's your most special-ever landracing.com t-shirt -- signed by not only Andy Green, but by me and Nancy! Mike Cook of Cook Motorsports is the guy that has coordinated the top speed shootout, getting the FIA and USAC and all that stuff together. Here's Mike and Sumner, who will probably try to take credit for doing everything(?). 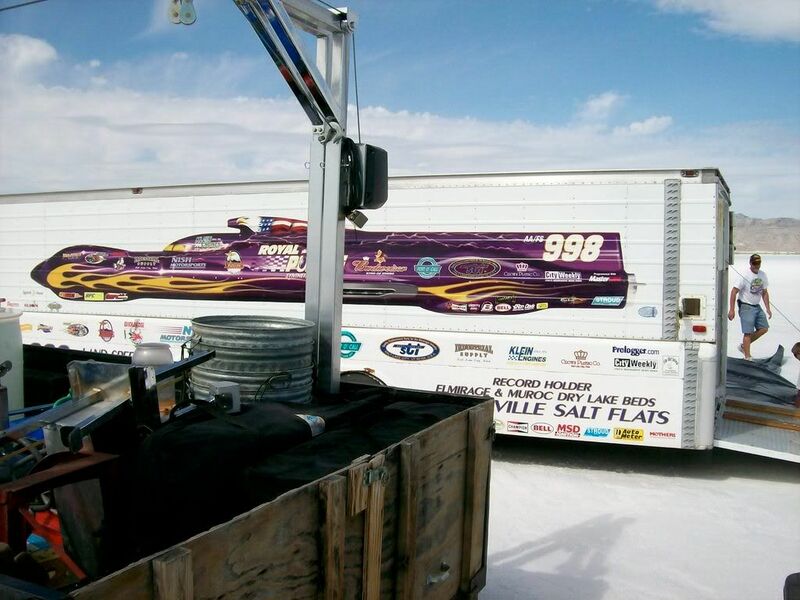 The Nish streamliner is here, inside the trailer while they set up the pit ground cover and awning. Mike says we should be there first thing tomorrow morning to watch things get started. Since Burklands and all three bikes weren't there when we left -- I wouldn't expect all to be running at first light. But -- we'll see, and you'll see what we see. Oh, yeah -- I need to thank Debbie Dross most personally and thankfully for grabbing the handles and trying to help my lame-o efforts to publish what's going on out here. I don't know how the survey is going on how to best display results), but between your ideas and her abilities and the stuff I gather -- we'll get it done. I wonder if there's a way for me to post links to forum topics -- put the links right on the front page so non-forum members can click and go directly to the stuff they wanna see. I think maybe not -- you've gotta be a registered forum member to do that, right? Anyway, we're working on it. Now I'm going back to the Mormon Meteor topic and put up some more videos. I've just finished the photography stuff at Miller Motorsports Park: GrandAm finale yesterday and support races today. I'm headin west to Wendover. Does anyone know what the Mormon Missile ran Friday or Saturday since the results are not up yet? I wish I could have heard it during SW. If he didn't go past 250mph, the "twins" weren't awake yet. The sound gets "interesting" when you get up on charger with a V8 diesel. If they get the bugs worked out, that Dmax is going rock-n-roll. 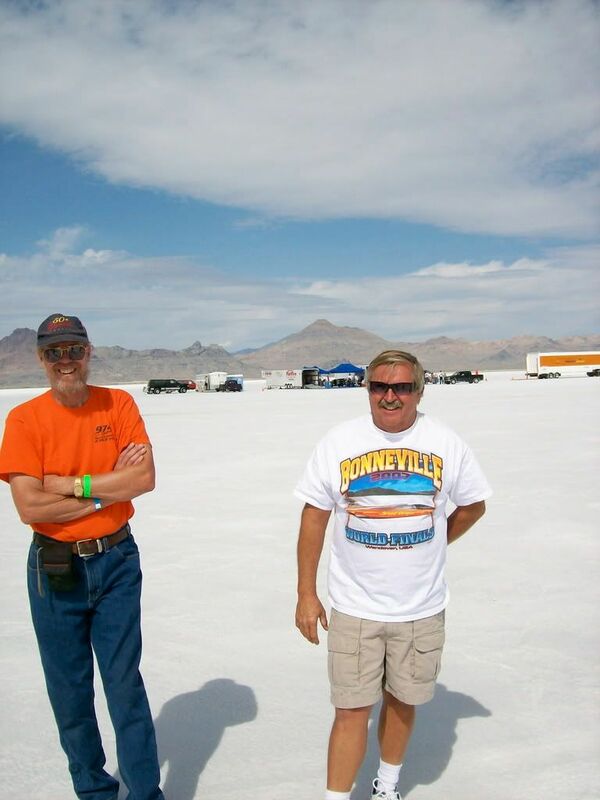 Sidenote: Lynn Goodfellow helped us out of a bind during SW when he did some welding for us. Good people. The front of the landracing shirts are cool, but I really like the back. Do you have a picture to show everyone? If you're talking about the shirt that Heather is holding up -- that IS the back. I'll take and post a photo of the front if that's what you mean. Thanks. By the way, Heather is not only the girlfriend of Bo Burkdoll, but also the grand daughter of Mary West (the Save the Salt lady). Is ERC Fuels staying for this Event ? 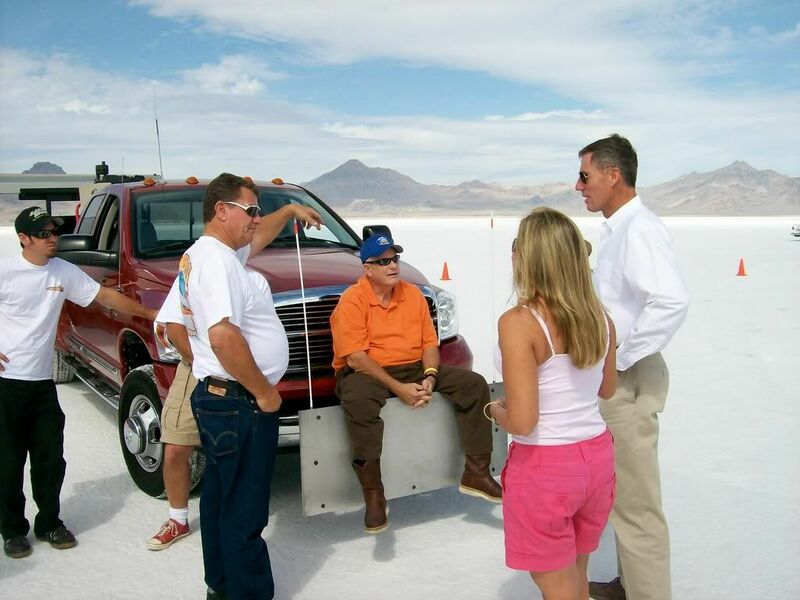 You know, I kind of wondered where the fuel is coming from for the top speed shootout. 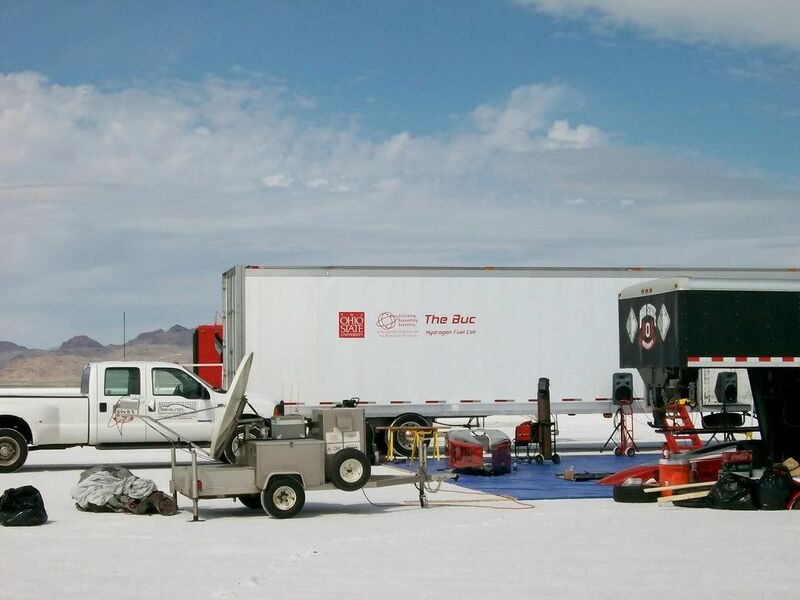 The ERC trailers are parked out by the truckstop/Salt Flats Cafe -- NOT on the salt. So extrapolating from that I have come to the conclusion that no, ERC isn't the fuel supplier. Nancy and I are going out to the event first thing tomorrow -- I'll see where the fuel is coming from. I already know that the Buckeye Bullet supplies it's own H2, and the Mormon Missile has a supply of diesel. I'll find out if everyone else brings his own. If I dont get them soon I will hopefully have someone pick them up for me at the WF. Enjoy the meet and keep us posted as you get time !